Browing the various FaaS options out there? Here's how to get started with Cloud Functions for Firebase, based on Google Cloud Functions. Since I am going to use Cloud Functions for Firebase a bit more in upcoming posts on this blog, I am going to give a very brief overview of how you can use and test them. Cloud Functions is a Node.js-based offering where you can expose stateless services. You can use it to react to certain Firebase events (not covered in this post) or to react to HTTP events. They are more or less the same as Google Cloud Functions but are triggered by other events. Of course, you have access to all those other Firebase services from within Cloud Functions for Firebase. Warning: I am only describing functions triggered by HTTP. I do not deal with the real-time database or the storage triggers and so on. If you’re interested in the full list of possible triggers, see the official documentation. You can use the same command to update the Firebase command line tools later on. Since Google updates them frequently, Google recommends using the latest version. So even if you already have them installed, you might want to update. The tool asks whether you want to provide anonymous stats and afterward starts the browser (should this not work automatically, it prints a rather longish URL to copy into your browser). As usual, you get a list of things the command line tools need to do and you can grant the necessary permission to do so, by clicking “Allow”. If you want to create a new project in the web-based Firebase Console, now would be the right time to do so. Afterwards switch back to the command line. You can navigate to the second option using the up/down keys on your keyboard and then select “Functions: Configure and deploy Cloud Functions” by pressing space when the arrow points to this option. With pressing space again, you can deselect selected options. In the next step, you have to select the Firebase project you want your Cloud Functions to be associated with. Again use your arrow keys and space to select the appropriate option. Even though there is a “create a new project” option, I recommend creating the project in the web-based Firebase console before running firebase init. You can abort the tool at any time with Ctrl-D or Ctrl-C. Afterwards, the tool creates the necessary project structure for creating Cloud Functions and deploying them to Firebase. The Firebase command line tool creates the npm dependencies by default, but before it does so, it asks you whether it should do so. I recommend installing the dependencies, as you will need them anyway. So simply hit enter when the question pops up. If you are using Sonatype or any other private npm repository, you shouldn’t install the dependencies. Instead, you have to change the created package.json file after the project has been set up so that it points to your repository URL. The top level folder contains relevant information for Firebase. The .firebaserc file, for example, contains the information to which Firebase project the function should be deployed. 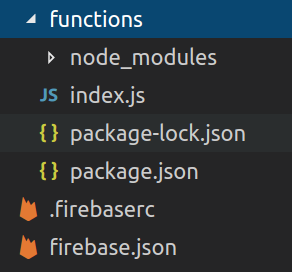 Finally, there’s the sub-folder node_modules that contains all the necessary dependencies of your project. Even without anything added by yourself, it contains already quite a lot of modules. You need to add the firebase-functions module to your code and – obviously – the code of your function. With this code, you export the function yourFunction. While I will cover deployment a bit down, for now, it’s enough to know that the firebase command line tool deploys all exported functions by default. You can use as many functions as you like within your index.js. Just remember to keep your code concise and tidy and consider using your own modules to keep the logic separate from your functions. The req and res paramters are the same Request and Response objects you might know from Express – a very common framework to develop web apps with Node.js. With the Request object you can get more information about the request. For example, you can get access to the headers and the body of the HTTP request or to the query string used for the request. You need the Response object to generate the answer you want to send back to the client. You can set the status code, set headers and a body in your response. Unit testing Cloud Functions is not really a problem. You have to call your function and assert that it does what you want it to do. So basically you have to verify that the res object is in the expected state after your function has been executed. Before coding tests, you need to have the necessary test libs. I’m using Mocha for running the tests and Chai for testing assertions in a nice way using Chai’s should assertion style. The option --save-dev ensures that the lib is not packaged when you deploy your function, while still being available when running your tests. For example, I create a mock status() function on the response object, since I set the status using this method in my code. The next request to http://myexternalapi.com/mytestpath/ would then be answered with the JSON specified. Alas, starting the local server is not really a very fast option. You have to wait a few seconds until a localhost URL is printed for your function. After that, you can use it – either by loading the URL in your browser, using Postman or by using curl. There won’t be a log file, but any console.log() output of your code will be printed directly to the command line. Not perfect, but sufficient for local testing. Even though the local deployment is too slow for my liking, it really helps detect flaws – especially in the beginning, when you’re not entirely sure what your mock request and response objects should look like. I strongly recommend testing locally before deploying to the Firebase cloud. The tool checks if the project has been set up correctly and is backed by a Firebase project in the cloud, then zips your project and uploads it. Finally, it prints the URL at which your function can be accessed. The deploy tool also prints the URL to the project console. You can use the project console to see how often each of your functions was executed, to see the logs and to see the total number of invocations. Depending on your plan, this might be important information for your billing. The --only yourFunction part limits the output to the lines that belong to this specific function. You can also omit this option, in which case you get all the logs. So with this, you should have a good understanding of what Cloud Functions for Firebase is and how to use it, and – very importantly – how to properly test the functions you deploy to the Firebase cloud. I am going to use those functions in my upcoming tutorials about developing apps for the Google Assistant. But all in all, they can be used wherever a stateless service makes sense. Depending on your workload and your use case, serverless computing can be a very cost-effective solution since you pay exactly for what you need. Until next time: Happy coding! Published at DZone with permission of Wolfram Rittmeyer , DZone MVB. See the original article here.